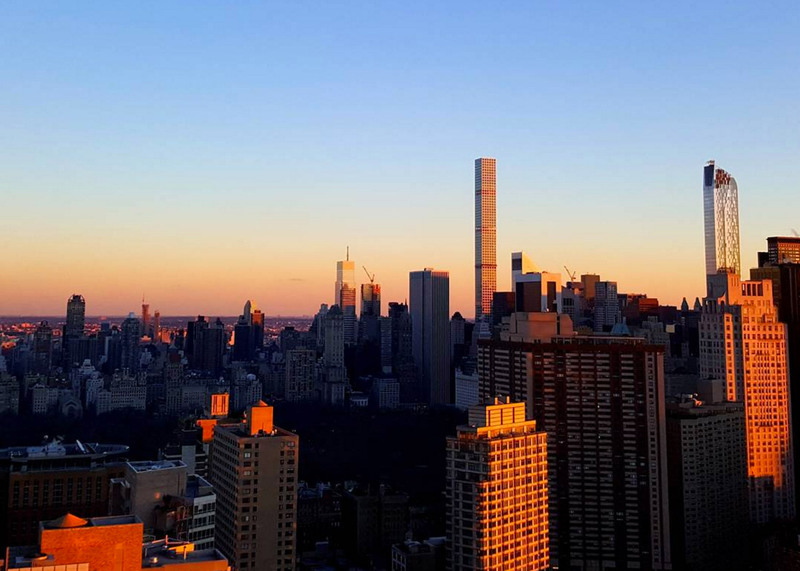 Instagram users have captured dramatic images of 432 Park Avenue, the super-tall tower in Manhattan by Rafael Viñoly Architects that is set to open this year. Rising 1,396 feet (425 metres), the skyscraper is regarded as the tallest residential building in the western hemisphere. If measured based on roof height, it is the tallest building in New York, surpassing SOM's One World Trade Center by 28 feet (8.5 metres). The rectilinear 96-storey skyscraper, which features a gridded concrete facade, was designed by New York-based Uruguayan architect Rafael Viñoly and is being developed by Macklowe Properties and CIM Group. Construction began in 2011 and is nearly finished, with hoists expected to be removed within the next few months. An official opening date has not yet been announced, although sources say it will occur this year. The tower's first condominium, located on the 35th floor, was sold in late December for $18 million (£12 million). The sale prompted the Council on Tall Buildings and Urban Habitat to declare the tower complete. "The CTBUH officially confirmed 432 Park Avenue's completion date to be December 23, 2015, as this was when the first owners closed on their residences and the building met CTBUH's final criteria for completion – that the building be at least partially occupiable," the Chicago-based organisation stated, noting that there are now 100 completed super-tall buildings around the world. The sale of all 104 units within 432 Park Avenue is expected to total $3.1 billion (£2.1 billion), which would set a record for New York City, according to Curbed. Located near Central Park, the tower rises up from Park Avenue, between 56th and 57th Streets. Its perfectly square footprint extends all the way to the top, with each side of the tower measuring 93 feet (28 metres) and each floor plate measuring 8,650 square feet (803 square metres). The tower has an exposed concrete structural frame, which enables column-free interiors. Several open floors enable wind to pass through the building. Viñoly has said the design — specifically, the grid-like facade – was partly inspired by a metal trash bin designed by the Austrian architect Josef Hoffmann. He has also said the big idea, or "parti", is simply that the building is a skyscraper. "I always thought that this was a building type that came without the agony of trying to find the parti because it's a parti in and of itself," said Viñoly during a 2014 lecture in New York. Inside, the tower offers amenities totaling 30,000 square feet (2,780 square metres), including a screening room, a billiards room, an indoor pool, a spa, a restaurant and a tree-filled plaza. Images show a sleek lobby with marble and wood finishes, and a porte cochere covered with a glass canopy. The condo units – described as "Palladian-proportioned spaces" – feature ceiling heights of over 12 feet (3.6 metres) and 10 by 10 foot windows (three by three metres). The tower offers "the grand experience of estate living — in the sky", said the developer. A number of design firms are involved in the project. New York-based SLCE Architects is serving as executive architect, and interior design is being overseen by Deborah Berke Partners, Bentel & Bentel, Lilla J Smith and Viñoly. Zion Breen Richardson Associates is providing landscape design service, and Handel Architects was the masterplanner. The Drake Hotel, a historic 21-storey tower dating to 1926, was demolished to make way for the super-tall tower. Construction was temporarily halted in January 2015 due to a complaint about falling construction material, as Dezeen reported. A 2.5-metre pipe reportedly dropped from a hoist on the 81st floor of the tower and landed in the street. Nobody was injured, and construction resumed following an inspection by the city. 432 Park Avenue is one of several skinny skyscrapers now rising in central Manhattan, ranging from a skinny skyscraper by Foster + Partners to a rash of super-tall towers that have sparked protests due to the long shadows they cast over Central Park. In a piece for Dezeen, architect Steven Holl said that "architecture with a sense of social purpose is becoming increasingly rare". Dezeen columnist Aaron Betsky has also said that the towers are part of Manhattan's transformation into a Capitalist holy land with no space for the poor.